Between 2009 and 2017, the government has only issued 13 naturalised citizenships to individuals who were born to a Nepali mother and a foreign father. Many are waiting hoping to be the next. The first time Anil Tamrakar visited the District Administration’s Office in Kathmandu to apply for citizenship, he was told the law didn’t recognise him as a citizen. But there was hope. A new constitution was being written and Tamrakar, a child of a Nepali mother and a foreign father, was assured that after the constitution’s promulgation, he would get citizenship through his mother. So he waited patiently. A year passed, then two, and then three. Then the news broke that the Constituent Assembly, the body tasked with writing the new constitution, had been dissolved and the dates for a new election kept getting pushed back. Tamrakar, who spoke to the Post on condition that he only be identified by a pseudonym because his friends don’t know about his status, said he was devastated. Like many of his classmates in high school, he had been planning to go to Australia for college. And now he couldn’t. By the time the new Constituent Assembly elections finally took place in November 2013, Tamrakar had bid farewell to six of his closest friends. With each friend’s departure for colleges abroad, he felt more and more dejected. Tamrakar, now 26, said he even had suicidal thoughts at one point. Technically, Tamrakar was already eligible for naturalised citizenship when he visited the district office for the first time in 2010. Even though the new constitution hadn’t been promulgated then, the interim constitution had a provision for children born to Nepali mothers and foreign fathers to receive naturalised citizenship—the same provision that is in the current constitution. Despite this, officials at the Kathmandu District Administration Office have repeatedly refused to accept Tamrakar’s citizenship application. In an interview with the Post, Kathmandu Chief District Officer Ram Prasad Acharya admitted his office was not accepting citizenship applications of those with foreign fathers and individuals whose father’s identity is unknown. When asked why that was the case since the current laws already have provisions for providing citizenship to individuals under those circumstances, Acharya said his office had to be cautious as citizenship is a sensitive issue. “Who is going to be liable when these applicants turn out to be non-Nepalis?” he said. By attaching conditions to how women can pass on citizenship, the state, according to some activists, has essentially rendered women as second-class citizens. 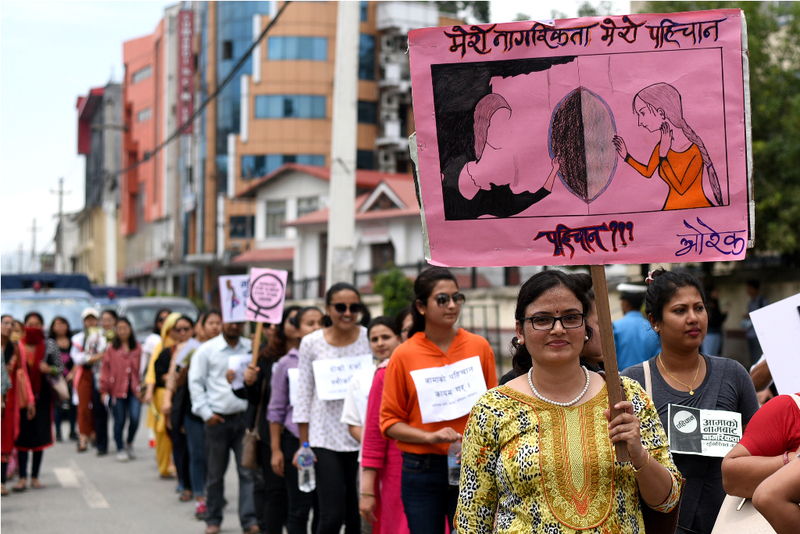 Women activists take out a rally against discriminatory provisions of citizenship law in Kathmandu in this 2018 file photo. Even though individuals such as Tamrakar can obtain Nepali citizenship through naturalisation—on the paper—through their mother, in reality, it is nearly impossible to receive one, according to advocates for equality in citizenship. According to Mulmi, the process of obtaining naturalised citizenship through a mother is extremely lengthy and one that’s riddled with complications. First, an applicant needs to receive a recommendation from the Ward Office, then he/she needs to present proof of not obtaining citizenship of their father’s country, and then the application is to be reviewed by the chief district officer who decides whether to forward it to the Home Ministry or reject it. “Very few applications make it to the Home Ministry and of those, only a minuscule number gets approved,” said Mulmi. Between 2009 and 2017, only 13 such naturalised citizenship certificates had been issued by the Ministry of Home Affairs, less than two per year. An estimated 5.4 million individuals, nearly a quarter of the population aged 16 and over, do not have citizenship documentation in the country, according to the 2018 US State Department’s annual report on human rights in Nepal. Without citizenship documents, these individuals are not able to register to vote, open bank accounts, apply for a driving licence, buy or sell land, appear for professional exams, register marriages or births, and receive state social benefits. Tamrakar, who has been helping a friend run a restaurant in the Valley, says he has to depend on friends for every little thing: whether it is opening a bank account or driving him around. “I have to use my friends’ bank accounts to receive my salary, I have to ask them to drive me home when I am working late, I can’t open a business under my own name,” he said. In 2011, the Supreme Court decided on a landmark case of Sabina Damai v the Government of Nepal, Office of the Prime Minister and Cabinet of Ministers, etc. Damai, a resident of Dolakha, had been trying to get citizenship through her mother, but her application had been repeatedly rejected by the District Administration Office. The court ruled in Damai’s favor, stating citizenship certificates should be provided through mother in cases where the child is born in Nepal to a Nepali mother and the father is not traced, and said the law had not been implemented correctly. In 2015, Gurung, the activist who quit her job to devote her time fully to advocating for equal citizenship rights for women, went to court after the Kathmandu District Administration Office refused to accept her daughter’s applications for citizenship in her name. Two years later, the court ruled in her favour. Despite multiple court precedents, like Gurung’s, the district administration offices across the country have repeatedly refused to accept applications for citizenship through mothers. “I don’t understand why they are so hesitant to give a citizenship to me when they have no hesitation doling out citizenship certificate to a foreigner who has only been in the country for a month,” said Yabesh Adhikari, 19, referring to the recent news about a Pakistani woman who received Nepali citizenship within a month of her marriage to a Nepali man. Adhikari, who has been trying for the past year to receive his citizenship through his mother, said that local officials told him he would have to wait until the passage of the Citizenship Amendment Bill, currently being discussed at the State Affairs and Good Governance Committee. In recent weeks, the State Affairs and Good Governance committee which has been deliberating over the Citizenship Amendment Bill, has drawn flak for sexist comments made by male lawmakers during its meetings. Last week, the committee announced it had formed a sub-committee to finalise the process for citizenship by naturalisation after multiple meetings failed to reach a consensus. The nine-member subcommittee has been given two weeks time to resolve the debate over contentious provisions and submit a final report.